Hampshire Equine Clinic is ahead of the game! CET is delighted to announce that Hampshire Equine Clinic has purchased a CET Equine Spa for its new facilities in Alton, Hampshire. Even though the clinic hasn’t officially opened its doors yet, it has been inundated with clients wishing to take advantage of our leading therapeutic spa treatment. The principal vet from the clinic believes that no veterinary practice should do without a CET Equine Spa! Good luck to all involved in this exciting new endeavour! The renowned Stall Wieserhof has become the latest trotting and rehab yard to add a CET Equine Spa to its facilities. The yard, based in Aschheim near Munich, is home to numerous horses, who will now feel the benefits of CET technology. Prior to that, just last year, Horse Resort Rotegg rehab centre in Germany purchased a CET Equine Spa. It has proven to be a great addition to the facility, which now boasts horse hydrotherapy as well as physiotherapy, acupuncture and other therapeutic treatments. 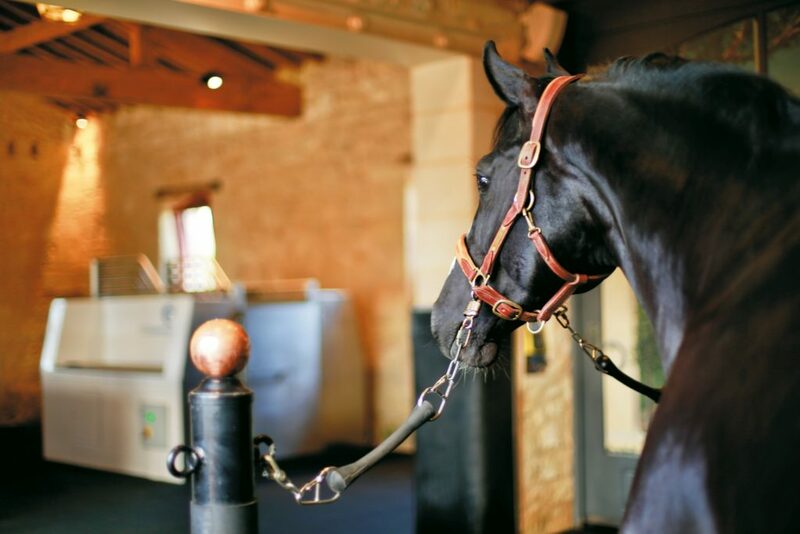 Set on 350 hectares of land and steeped in centuries of viticulture history, the Haras de Malleret is the most recent home to a CET Equine Spa in France. This historic place is dedicated exclusively to preparing and caring for horses as genuine top-level athletes. For just a single session or for several weeks, owners can place their animals in the expert hands of devoted professionals. The facility is fitted out with the latest equipment for preparation, rehabilitation therapy or simply to recover after physical efforts. Set within the tropical rainforest near Teresópolis in Brazil, EquiPrime Rehabilitation Centre makes room for the first Equine Spa in all of South America. The centre offers a combination of high-quality technology and equipment to treat and improve the condition of injured horses. 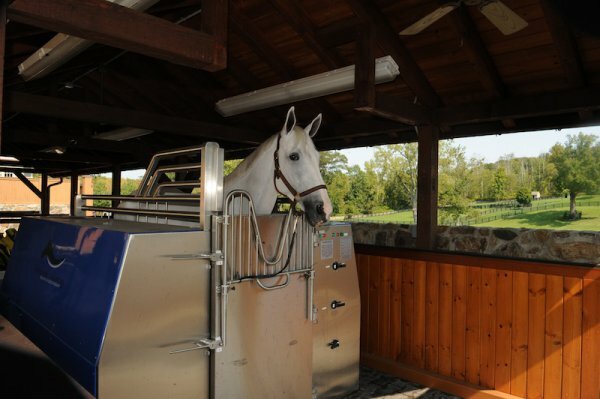 The CET Equine Spa is a fabulous addition to this leading facility. Wishing to set itself apart from other Equine Colleges in the UK, Moulton College had an Equine Spa installed at its facilities in Northamptonshire. Moulton now has one of the top facilities in the UK and attracts students from far and wide to its Horse Care Courses. Many domestic spas may use cartridge filters but public spas and pools now universally use some type of media filter such as sand or diatomaceous earth. The Pool Water Treatment Advisory Group (PWTAG) is a world leading authority that approves and promotes appropriate water treatment standards. The CET Premier Spa has been installed at Equine-Librium College in Plettenberg Bay, South Africa. Ronel van de Sijde, the driving force behind the new Equine College says "We are the first tertiary education institution in the world to offer a fully comprehensive and veterinary based full-time academic & practical education within the field of equine therapy. Our Principal, Professor Sybrand van de Berg (BVSc (Hon), MMed Vet (Surg), MMed Vet (RAD) DVSc) is involved at the College on a full-time basis and is well known to everyone as Head of Department of Surgery, Faculty of Veterinary Science at University of Pretoria-Onderstepoort". For more information see Equine Librium. Ronel van de Sijde is the driving force behind a new equine therapy college and equine rehabilitation centre in South Africa. A former international pentathlete and qualified sports scientist, specializing in bio-kinetics, Ronel has spent years travelling the world to qualify as an equine therapist. Here she reveals the decision making process prior to purchasing an equine spa for her new facility. "When studying in Kentucky, I came across an equine spa during a visit to Churchill Downs and was immediately attracted to the therapy. I could understand the logic behind it and I recognized the benefit of a drug free therapy for treating and preventing leg injuries. However, I was horrified to witness a horse jumping out of the spa in front of my eyes. It teetered on the top of the door, rocking back and forwards a few times. I thought it was going to fall backwards into the spa - it was very, very scary - but it finally slipped forwards off the door and I realized I needed to find a safer alternative for my client's horses and my own peace of mind. When I returned home to South Africa I researched online and came across the CET Equine Spa website and was immediately impressed with the safety features. Meanwhile, I had heard positive feedback from some of my equine contacts so decided to go with CET and I am very glad I did. They came out to South Africa, set up the spa and then trained myself, and my staff, and I am very happy with the results. As well as purchasing the CET Premier Spa I acquired the portable version, the CET Mini Spa and it too is a great product. We are able to take it with us when we go to competitions and the horses adapted to it very quickly. Now that we have the spas in place we plan to complete some research with our senior equine therapy students under the guidance of Professor Sybrand van de Berg. His reputation and expertise in identifying and treating lameness in horses provides us with the ideal support for on-going research programmes." As we enter 2012, the New Year prompts us to look at things from afresh and this year, says Colin Edgar, Managing Director of equine spa manufacturer CET Ltd, we are focusing on improving the door locking mechanism. While the previous design was already the safest on the market it could not be opened in one movement with one hand and that is what we have achieved with our latest innovation. As we manufacture the spas in-house and do not sub-contract we have the specialist skills and knowledge to aid product development and provide an excellent after sales service to existing and new clients. This is the third year in a row that CET have been to the Rolex World Cup in Geneva where the worlds leading showjumpers use the spa to keep their horses in prime condition for the competition. We spa'd 30 horses in one day, said Colin Edgar, Managing Director of CET Equine Spas, and the water was still at 1 C which is a testament to the quality of the system. Leading Brazilian showjumper, Rodrigo Pessoa, uses the spa regularly both at his own yard in Belgium and at Double H Ranch in Wellington when he is based in Florida. "Rodrigo Pessoa installs a second CET Premier Equine Spa at Double H Farm Wellington, Florida..."
"As we get ever deeper into the 21st century with all its technological advances, even the horse world must move forward..."
The other large item often seen these days is the hydrotherapy spa, supplied by companies such as CET Horse Spa (used by Rodrigo Pessoa, Alvaro Miranda and Markus Fuchs)..."